The now 20-unit Kohl Construction condo proposal goes back before Northampton’s Conservation Commission on September 10, 5:30pm in the City Hall Hearing Room, 210 Main Street, 2nd floor (enter via the back door). Concerned citizens are urged to attend. Here is the commission’s agenda followed by Land Use and Conservation Planner Bruce Young’s staff report. 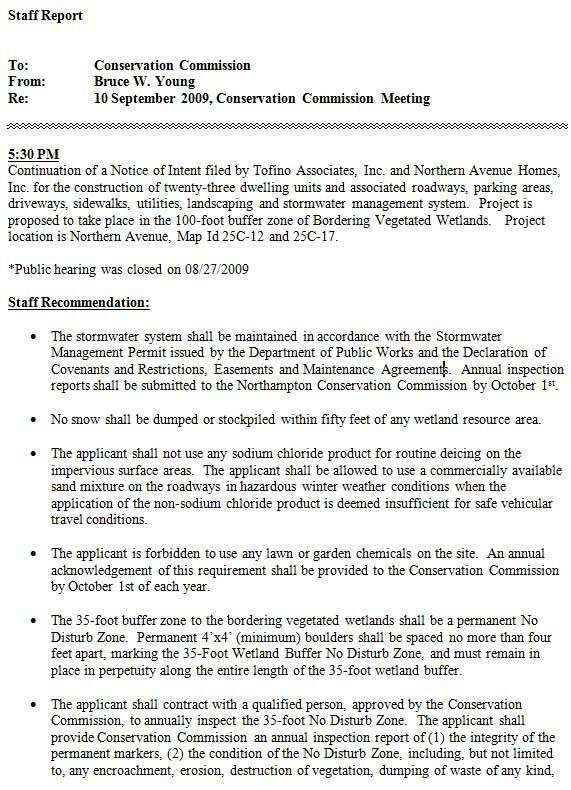 Continuation of a Notice of Intent filed by Tofino Associates, Inc. and Northern Avenue Homes, Inc. for the construction of twenty-three dwelling units and associated roadways, parking areas, driveways, sidewalks, utilities, landscaping and stormwater management system. Project is proposed to take place in the 100-foot buffer zone of Bordering Vegetated Wetlands. Project location is Northern Avenue, Map Id 25C-12 and 25C-17. Request by John Clapp for a support letter for a Community Preservation Act application for funds to restore the Upper Roberts Meadow Dam in Leeds. The commissioners decided to take a firm stand on requiring four-foot diameter boulders to protect most of the 35-foot no-disturb zone around the Millyard Brook wetlands. Doug Kohl had asked for something less obtrusive, but the commissioners believe that nothing less will deter encroachment over the long term, considering past experience. As you can see from the charts, these boulders might be a tight fit considering how close some condos and paths are to the 35-foot line. Based on the longevity of the seed bank, eradication might be a 20-year project or more, far longer than the year or two (or even 10) contemplated in Kohl’s latest written proposal. 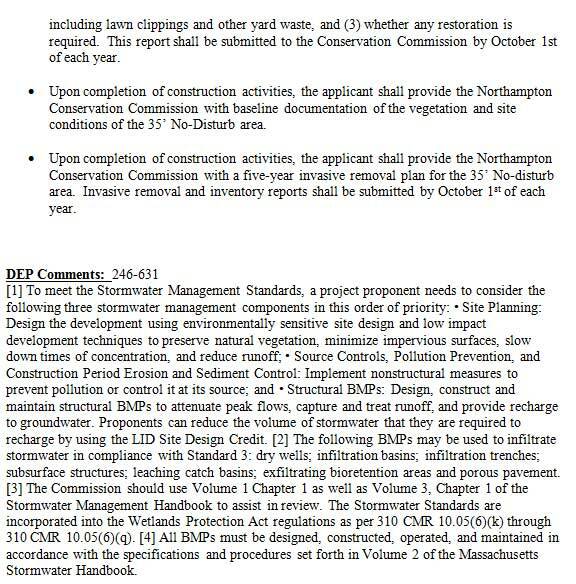 It seems unreasonable and unrealistic to ask a developer and the Conservation Commission to implement and monitor such a lengthy program, especially when non-compliance with wetlands agreements has proven to be a widespread problem in Northampton. Infill, Kohl Construction Plans, Wetlands, What You Can Do. permalink.